Libertarians like to shout their belief that �the welfare state has created nothing.� I wonder if they think the welfare state was not the one in the 1930s through 1960s that funded the basic research, then specific research to create transistors, computers, and the internet. Perhaps they think NASA was somehow not part of the welfare state? Perhaps all the spin-offs of NASA--such as modern medical monitoring equipment--or the Apollo Guidance Computer, which drove forward the technological boundaries of integrated circuits and software development as well as computers in general--do not really exist because �the welfare state� could not possibly have created them? (The libertarian ideology apparently must be kept pure�shades of the doctrinaire Marxist-Leninist!) Perhaps all those spinoffs are just figments of the fevered imaginations of those terrible statists who want to �redistribute wealth�? People like Jeff Bezos and Bill Gates and Peter Thiel and every single other chest-pounding libertarian CEO of Silicon Valley (it is frankly disgusting that so many people in the industry given such support to organizations like the Reason Foundation) would have NOTHING, absolutely effing nothing, were it not for what the U.S. government did in the 1930s through 1960s that resulted in the creation of computers and the internet. These people owe everything they have to the United States of America. Without those government programs and that government support � and let's not forget the tens of thousands of kids that were educated at public land grand universities � there would be no computers, no software, no internet, no transistors, no semiconductors, no Silicon Valley, no Silicon Valley fortunes, no Microsoft, no Intel, no Apple, no PayPal, no Amazon. October, 1919. The Army and the Navy granted RCA the former American Marconi radio terminals that had been confiscated during World War One. Admiral Bullard received a seat on the Board of Directors of RCA. The result was Federally-created monopolies in radio for GE and the Westinghouse Corporation and in telephone systems for the American Telephone & Telegraph Company. The following cooperation among RCA, General Electric, the United Fruit Company, the Westinghouse Electric Corporation, and American Telephone and Telegraph (AT&T) brought about innovations in high-power radio technology, and also the founding of the National Broadcasting Company (NBC) in the US. 1925 - Western Electric Research Laboratories and part of the engineering department of the American Telephone & Telegraph company (AT&T) consolidated to form Bell Telephone Laboratories, Inc.
June 27, 1940 � President Roosevelt creates National Defense Research Committee on advice of Vannevar Bush; makes Bush chairman. Under the chairmanship of Bush the NDRC created new laboratories, including the Radiation Laboratory at the Massachusetts Institute of Technology, which aided the development of radar, and the Underwater Sound Laboratory at New London, Connecticut, which developed sonar. June 5, 1943 � Army Ordnance Corps, Research and Development Command contracts University of Pennsylvania�s Moore School of Electrical Engineering to design and build Electronic Numerical Integrator And Computer (ENIAC) to calculate artillery firing tables for the United States Army�s Ballistic Research Laboratory. Code name �Project PX�. Moore School also built the Electronic Discreet Variable Computer (EDVAC), which used a stored program and sequential processing. June 25-30, 1945 - John von Neumann's First Draft of a Report on the EDVAC, which described the logical design of a computer using stored-programs, distributed by Herman Goldstine. Von Neumann was then working on the Manhattan Project, and in a strenuous attempt to develop a machine able to perform the physics calculations needed to build an atomic bomb. 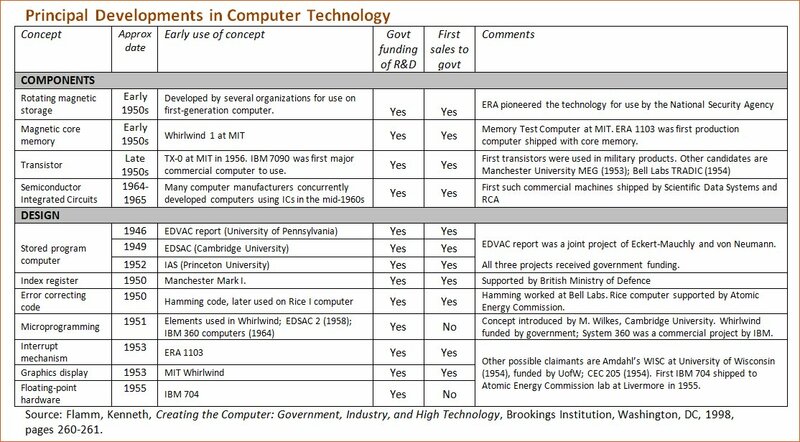 was basically prodding and informally coordinating the efforts to develop a computer at all the different university and military institutions working on various computer designs. Goldstine was serving as a lieutenant in the Army's Ballistic Research Laboratory and acting as the BRL liaison to the computer projects underway at the Moore School of Engineering at the University of Pennsylvania. July 1945 � Army Signal Corps� Project 414A (becomes Nike Ajax, first operational anti-aircraft missile system) contracted to Bell Laboratories conceives of computerized command and control for USA air defense. July 1945 � Vannevar Bush submits report to President Truman, entitled, Science, The Endless Frontier. Bush argued that basic scientific research was important to national survival for both military and commercial reasons, and required sustained government funding and support. Militarily, basic scientific research was the only way to ensure the development of superior weapons, and maintain that superiority. Commercially, basic scientific research was "the pacemaker of technological progress" which provided both new products and better, more efficient production capabilities. "New products and new processes do not appear full-grown," Bush wrote in the report. "They are founded on new principles and new conceptions, which in turn are painstakingly developed by research in the purest realms of science!" Science historian Daniel Kevles wrote that Bush's insistence "upon the principle of Federal patronage for the advancement of knowledge in the United States," was "a departure that came to govern Federal science policy after World War II." Read more. Bush's report led to legislation to create the National Science Foundation in May 1950. 1946 � Frederick Terman returns from MIT Radiation Lab to Stanford University as Dean of Engineering. Terman earned his doctorate studying under Vannevar Bush. July 8, 1946 thru August 30, 1946 � Moore School lectures on �Theory and Technique for the Design of Electronic Digital Computers� sponsored and funded by the Office of Naval Research and Army Ordnance Dept. This is the specific point in human history when a new technology is deliberately made available to the entire world. before this lecture series, barely a handful of people in the entire world have any idea of the entire process of designing, building, and operating an electronic computer. Here, the Army Ordnance Dept. and the Office of Naval Research deliberatly invite a hundred or more people to a series of seminars and lectures to share with them this new knowledge. Read more. January 1950 � George E. Valley, Jr., an MIT physics professor and chairman of the Air Defense System Engineering Committee, visits MIT Servomechanism Laboratory, conceives of Whirlwind as the basis for develop a computer-based air defense system. Major funding of Whirlwind shifts from ONR to the Air Force, and MIT Lincoln Laboratory takes over. IBM decides to work on project. Read more. April 1950 � Standard Eastern Automatic Computer completed by the National Bureau of Standards; first electronic digital von Neumann-type stored-program computer; source of a number of important technical innovations, including solid-state logic. new input-output mechanisms, an early example both of time sharing and the interconnection of two computers (the SEAC and the DYSEAC) in 1954, the development of marginal checking, new memory mechanisms, and a graphical display. Its development was supported by both the Navy and the Army. [Ruttan p93n5; Flamm 1988, pp. 68-75] Read more. May 1950 � National Science Foundation Act of 1950. 1951 - Stanford Dean of Engineering Frederick Terman convinces the University to establish Stanford Industrial Park (later Stanford Research Park), based on the model of university-government cooperative research Terman experienced at MIT Radiation Lab during World War Two. The first tenant was Varian Associates, founded by Stanford University alumni to build military radar components. Stanford Industrial Park is the seed which blossoms into Silicon Valley. Read more. October 28, 1953 � Air Force decides to build Semi-Automatic Ground Environment (SAGE) air defense project based on MIT Lincoln Laboratory and IBM Whirlwind. Uses largest computers ever built, IBM�s AN/FSQ-7, based on IBM 701. 1957 � eight engineers from Shockley Semiconductor Laboratory convince Fairchild to create Fairchild Semiconductor. Two of these eight, Robert Noyce and Gordon Moore, founded Intel in 1968. 1960s � Using money from NASA and the U.S. Air Force, Doug Engelbart invented the mouse and hypertext-based collaboration tools in the mid-1960s, while at Stanford Research Institute (now SRI International). Ruttan, Vernon W., Is War Necessary for Economic Growth? 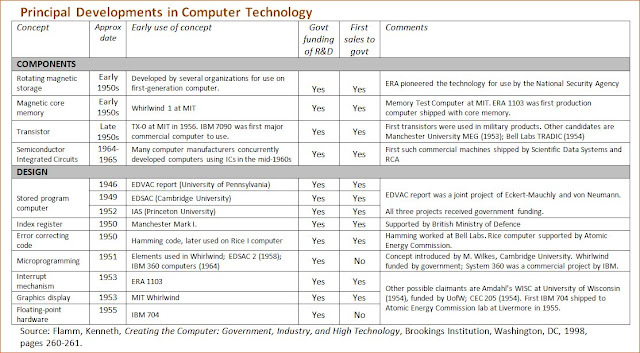 Military Procurement and Technology Development. New York City: Oxford University Press, 2006. Flamm, Kenneth, Creating the Computer: Government, Industry and High Technology, Washington DC, Brookings Institution Press, 1988. Riordan, Michael, and Lillian Hoddeson, Crystal Fire: The Invention of the Transistor and the Birth of the Information Age, New York, NY, W. W. Norton & Co., 1998. Smith, Merritt Roe, editor, Military Enterprise and Technological Change: Perspectives on the American Experience. Cambridge, MIT Press, 1985. Ceruzzi, Paul E., A History of Modern Computing, Cambridge, Mass., MIT Press, 2003.